The Tower Hill girls' and boys' indoor track team competed in the Delaware State Championship meet in Landover, Maryland, last weekend. 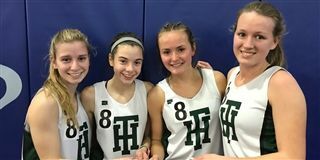 Each relay team ran a season's best time, and the girls' 4x8 (Nina Knitowski '21, Caroline Kirtley '22, Maggie Bailer '21 and Anna Reynolds '19) placed 7th in the state. Congratulations!